Gone are the days when you'd have to head down to the store and pick up a slideshow maker, a video maker, a video capture tool, a CD burning tool, an image editor and so on and so forth. With Easy Media Creator you're provided with all the tools in one, very full, box of tricks. If you want the best products on the market, expect to pay out extra - the copy of VideoWave you're supplied with here can't hold a candle to Adobe Photoshop Elements, nor will Paint Shop Pro quake at the thought of being replaced by PhotoSuite 7. Suites like this stick resolutely to the beginner end of the market, but often that's all you need to string together your clips and photographs. Give it a few more months and multimedia suites really will be able to do everything. They'll head out with your camera, track down your family and watch them like a hawk until they do something interesting, then mix it up on a DVD while you sleep. Possibly. Interestingly, top billing this time around doesn't go to one of the multimedia parts of the set - products whose names rather give away their speciality: Label Creator, My DVD Slideshow, DVD Builder and so on. Instead, the big new sell is Backup MyPC Deluxe, which offers a comprehensive way to both back up and restore your system data without having to drop out of Windows. Individual back-up profiles offer all the flexibility you need to password protect data, schedule your back-up runs and verify a successful copy. This isn't the only tool vying for the top spot, however. Assuming that your discs don't feature fiddly copy protection, you can mount and emulate them on the hard drive with the Disc Image Loader, saving yourself from having to keep all of your CDs on hand just to run a program or find a particular document. Of course, it's no trouble to burn or copy data either to or from a disc, including dual-layer. The usual copy-protection warnings apply here, however. Lots of legal wrangling against your interest means that taking backups of your favourite movies are a no-go area, unless you use other software to remove the protection first and you wouldn't do that - oh no, not at all. The fact that Easy Media Creator now features support for DivX should have no bearing on this, either. 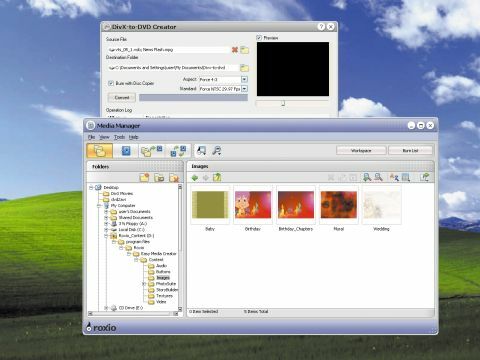 These tools aside, Easy Media Creator's star turn is still in creating and editing your own media files from scratch. In the case of DVDs, the process starts by running Capture to pull raw footage on to your machine, then pulling the individual clips into VideoWave 7 for reassembly. This gives you transitions, from traditional fades and wipes to more exciting routines like page turns and particle effects, with another set ready to be applied to individual clips. From there, you can assemble them into DVD/VideoCD presentations, complete with menus, slideshows, voiceovers and so on.